“I chose Theresa Marie because I didn’t want my pictures to look so staged and tacky like they do when you get them done in front of the screens. I had an amazing time and loved every part of it. I felt like a princess and was completely comfortable. Getting to meet Theresa Marie was my favorite part, we clicked right away and she made it so much fun! When I first saw my images, I was shocked! I couldn’t believe it was me, I looked amazing! I wouldn’t change anything about my experience! I had so much fun! The only thing I would change would be having more time to take pictures because it was so much fun! I would tell other seniors how sweet and kind Theresa Marie is! She makes you feel comfortable right away and her pictures are amazing! It’s the best experience I’ve ever had! My mother because she is very caring and loving to me no matter what. My Grandpa because he came here not knowing Spanish and became very successful. "Coming from Ohio, we were hesitant to get my pictures taken really anywhere but our local area. But after some research, and a Florida vacation planned, Theresa Marie came into the picture and we took a change and it was well worth it! I knew the experience was going to be amazing once I walked into her office. From getting my makeup done, picking out outfits, driving to the beach and the pictures themselves, my parents and I were all so excited. My favorite part was taking pictures on the beach because that was a dream I’ve always had, to get my senior pictures done on a beach. It truly was a dream come true. I was more than pleased when I saw my pictures. 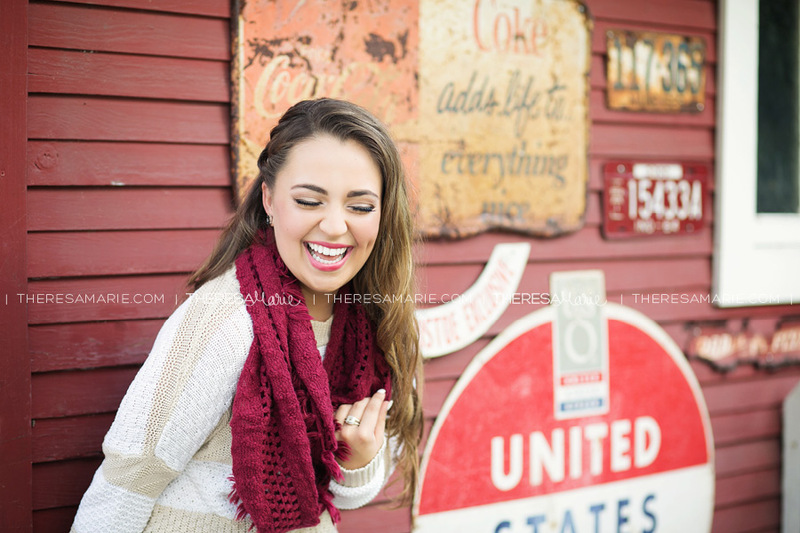 Theresa Marie captured my true personality and happiness in her pictures. I have never been so pleased with pictures of myself. I would not have changed anything about my experience. It all was flawless! I would recommend Theresa Marie to any parents or seniors, not only because she is a great photographer, but because of her personality. I think her personality was the thing that, after my pictures were over, my parents and I were so blown away by. It was meant to be that we picked her to take my senior pictures. I knew nothing about photographers in the area since we came to Florida for a vacation. After hearing about Theresa Marie and looking at her website, I knew I found the right photographer. Once the time came for my pictures, I was nervous and anxious because I knew nothing about her and her business, other than from her website. But the anxiety quickly vanished once we finally met. I knew I had made the right choice very quickly, and the day of my shoot was one I will never forget. 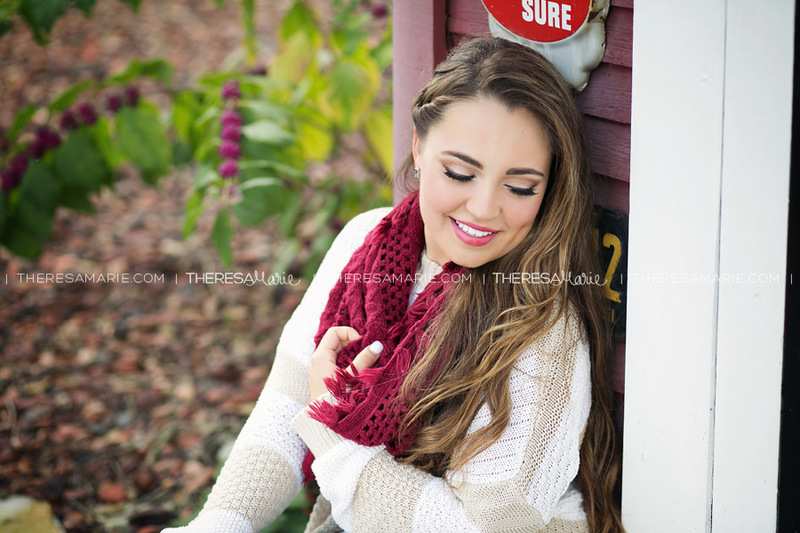 Theresa Marie made my senior picture shoot so memorable, and I can never thank her enough for that!" My parents because they have given me a life one could only dream of, my brothers for showing me how important family is, my art teacher for helping me do what I do best, my hairdresser because I adore her personality more than anyone I ever met, and my best friend Sydney for keeping me sane. Get a one way ticket to somewhere warm far far away and see where that leads me. 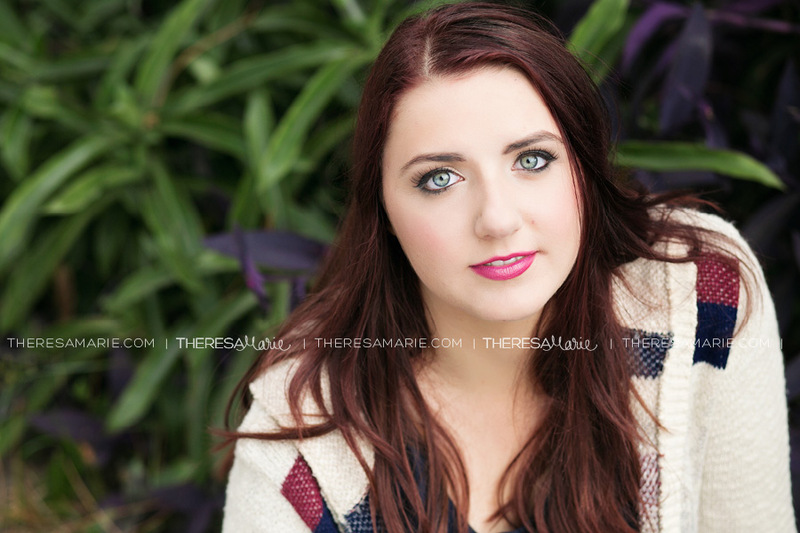 “All senior photos seemed the same until we found Theresa Marie’s web site. The images captured the spirit and personalities of the people and just seemed so “alive”. My overall experience with Theresa Marie was fabulous. From start to finish, the experience was first class. When we first saw the images, my mom cried and I thought they were so amazing. “I’m from Wisconsin, so my family’s biggest hesitation was the distance and how Theresa and I would communicate about my senior photos. We had very minimal face to face meetings. Although we had limited time together, Theresa made it very easy for us to communicate and talk via email and the phone. 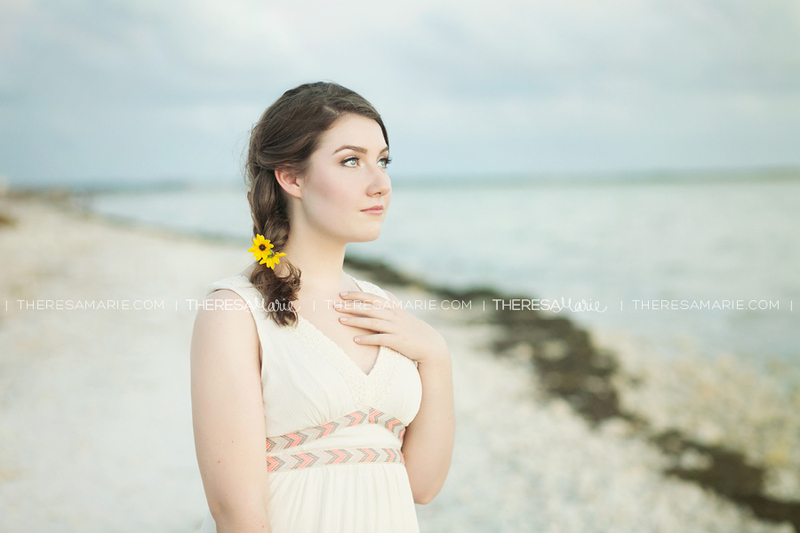 The price of her photography also made my parent’s hesitant, but Theresa definitely made it worth it! 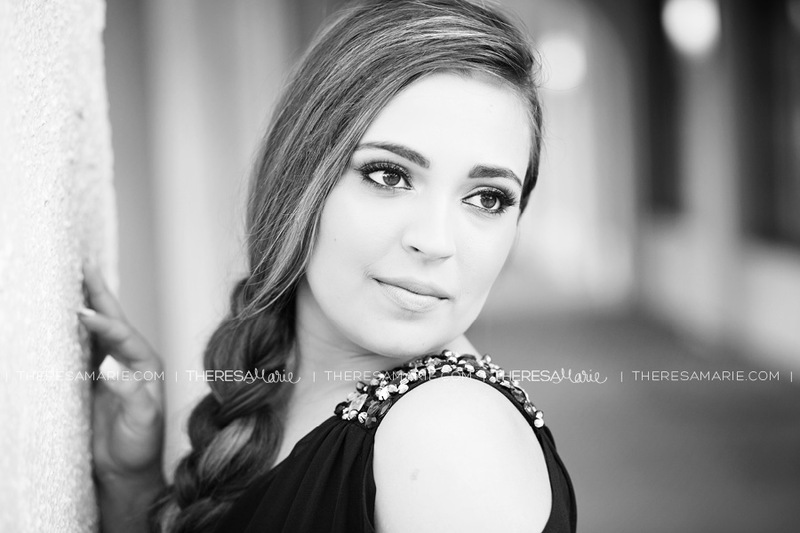 I chose Theresa Marie because I fell in love with her photos that I’ve seen on her blog! I could not stop stalking her website, it was literally perfect. Her photos looked so natural and not too edited. 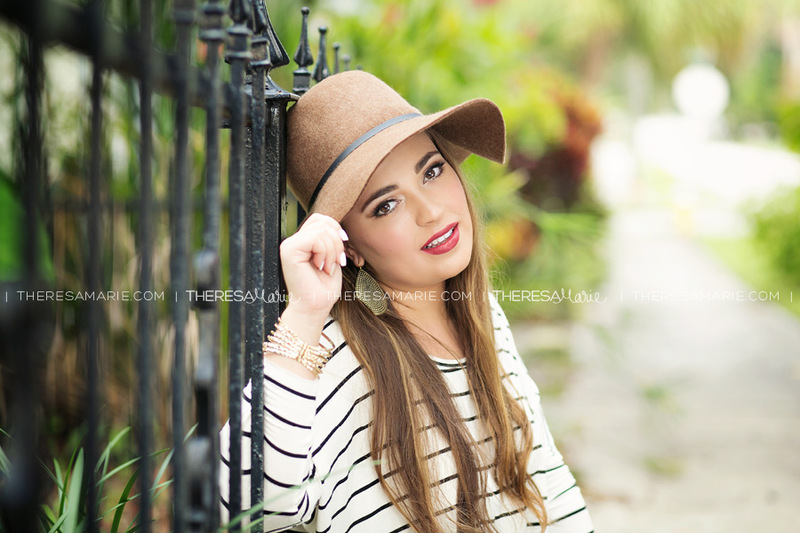 Theresa easily captured not only the person, but their personality. I loved working with Theresa Marie! She made me feel so comfortable when she was taking the photos. I didn’t feel self conscious or anything. What I love the most about her is that she alters the photography session and the reveal based off my interests. Theresa Marie let me make my decisions and she helped guide me too. My favorite part was the reveal, I was literally speechless. It was fun, looking through the photos and designing my photo heirloom. I did not believe it was me at all. I felt good about myself, and that’s what I love about Theresa Marie. She made me feel beautiful, which is what made my experience with her special. I wouldn’t have change anything! The preparation, the shoot, and the reveal was perfect. She did everything she could to make my family and I happy with my senior photos. She exceeded beyond my family and I’s expectations. My mother for sure! She has gone a long way from where she has come from. Many people, even her family, doubted her when she was young. But she proved them wrong and succeeded. She is the main reason why I am here today in America, all thanks to her hard work and I could not be anymore thankful for what she has given me. The OneRepublic station. Or the Disney station! Besides the football games, I think my favorite high school memory was celebrating Summerfest (Milwaukee Music Festival) with my closest friends. We were so carefree, and we were friends with literally everyone. We met so many new people and I became closer to those who I already knew. 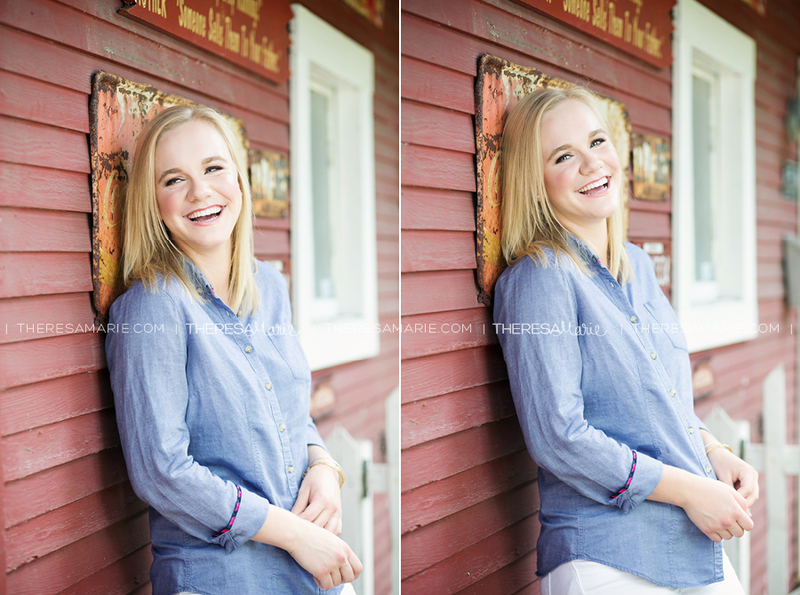 “My biggest hesitation about getting senior pictures done was the fear that they would look forced, fake, or just cheesy. However, we chose Theresa Marie because each and every client in her gallery looked like they were having a genuinely good time and she brought out everyone’s natural beauty. The whole process was fun instead of overwhelming. From cracking jokes during the photoshoot to picking the perfect canvas to take home, each moment was unforgettable. My favorite part was getting my hair and makeup done while eating snacks and just talking with Theresa. I felt so pampered! I felt confident and when I saw my images at the reveal I was amazed! I didn’t know I could look anything like those pictures portrayed! I think the hardest part was just waiting for the pictures because I was so excited! Otherwise, I wouldn’t change a thing! 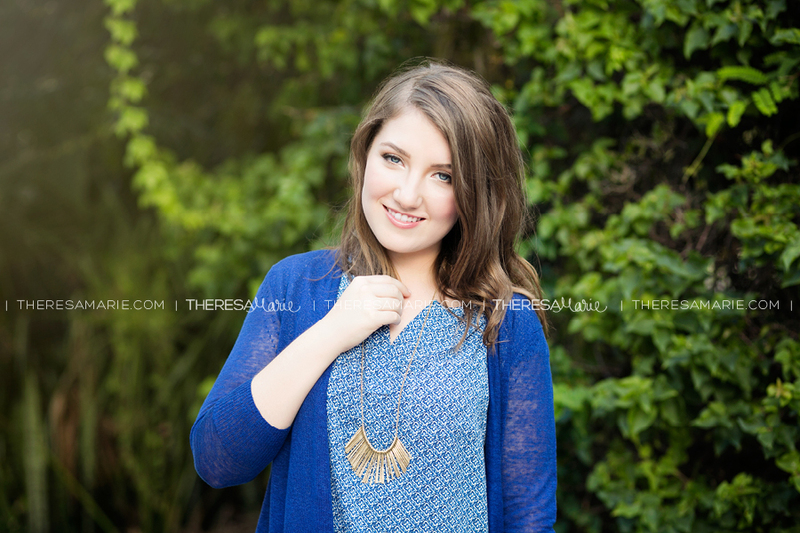 Before I walked into the Theresa Marie Studio, I was a self-concious, nervous senior! I knew I wanted to have pictures done for my senior year, but I was so nervous to have to pose and have my picture taken. 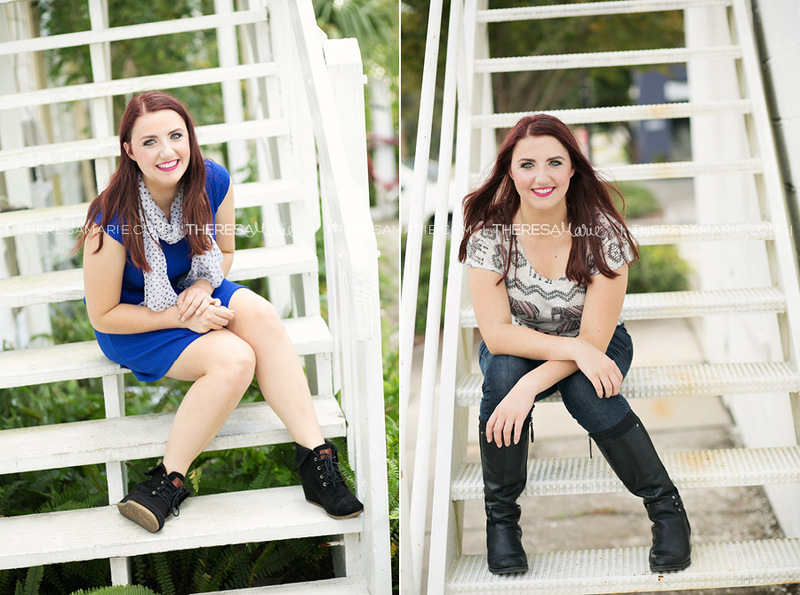 I chose Theresa Marie because of how natural and genuine her pictures looked and I made the right decsion! My role model is my mom! She is such a loving person and hard worker. 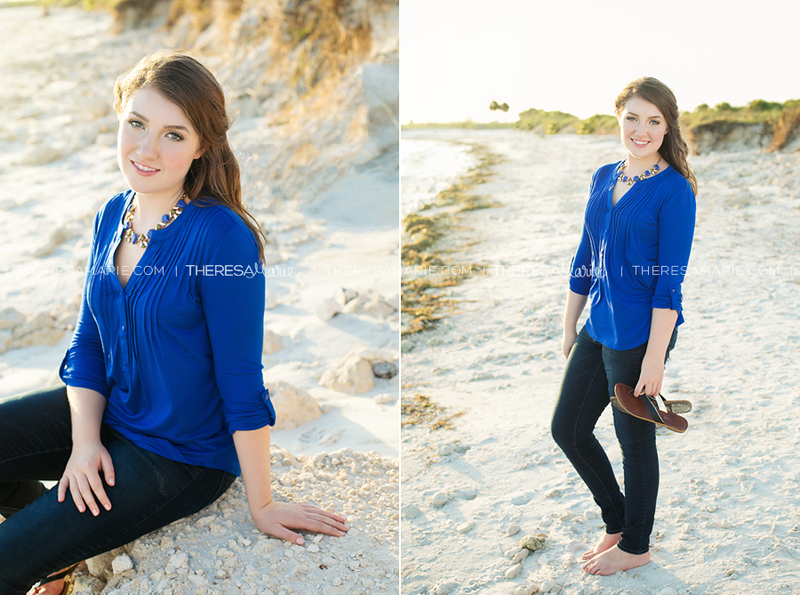 “I chose Theresa Marie because I always wanted my senior pictures on the beach. My cousin Hannah had them done by Theresa Marie and they looked absolutely stunning! I loved going to all the beaches and feeling like a superstar for the day, going everywhere we went. When I first saw my images, I was shocked! They looked amazing and I couldn’t ask for anything better. “I wasn’t sure where I wanted my senior portraits to be taken, and I wasn’t sure if the senior photographer that I’d choose would be able to capture the real me. 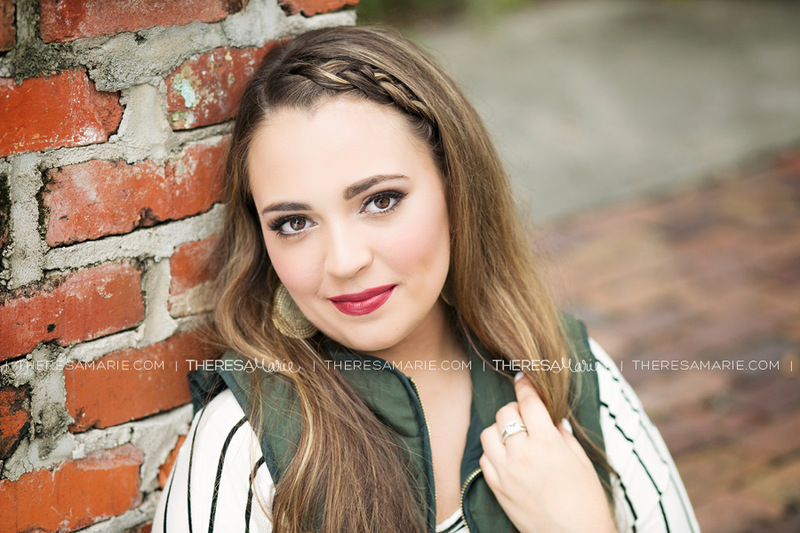 I chose Theresa Marie because her images were breathtaking and real– they were images that seemed to capture perfect moments of each and every senior. I was nervous because I had never taken photos like this before, especially a lot of them! I wanted to be comfortable and Theresa made me feel like I was at a home away from home. Theresa made me feel extremely welcome and appreciated. She made my nerves disappear and I soon became excited moments after meeting her for the first time. I loved playing music and just being myself, taking photos while I rocked out and laughed and smiled a lot. Theresa really encouraged the real me to shine through! My images exceeded my expectations in so many ways! I was in awe! I was so happy with what was produced. 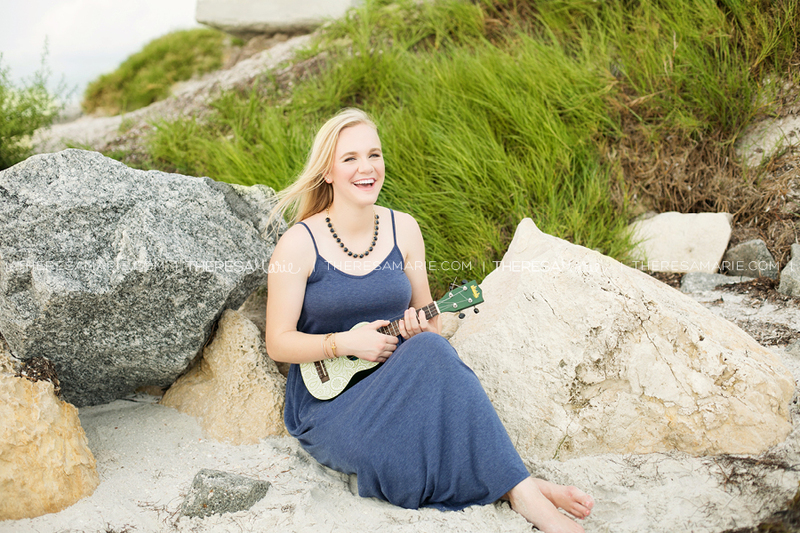 My favorite image was captured with my ukulele on the beach, which signifies such an importance of music in my life. It would probably be Follow Your Arrow by Kacey Musgraves. This song is just an anthem to completely be yourself & express what you really believe no matter what anyone else says. Definitely my parents — they’ve been through so much and have done so much for me. One of my best friends, Michaela, who just graduated from high school (a year ahead of me) because she has nurtured me from the very beginnings of our friendship when we were 7 and 8 years old. I loved Eat, Pray, Love simply because it was such an adventure and self-discovery book & it made me laugh and cry and be happy. If you had to listen to ONE station on Pandora until the end of time what would it be? 1. Master fingerpicking on the guitar. 2. Learn how to speak Spanish. 3. Live in NYC for longer than a week. 4. Go white-water rafting. 5. Adopt a child. probably be dreaming – ha-ha! Pulling an all-nighter (almost) after waking up at 7am on a Friday without school, going out to eat with my council members, decorating for prom all day, going to prom that night, then taking prom down, returning our supplies that night to the school at midnight Friday night, and going straight to Relay for Life at the high school stadium and staying up pretty much the entire night with my friends. TO BE A TEACHER and just work with little kids the rest of my life and inspire them to learn and play music and sing. 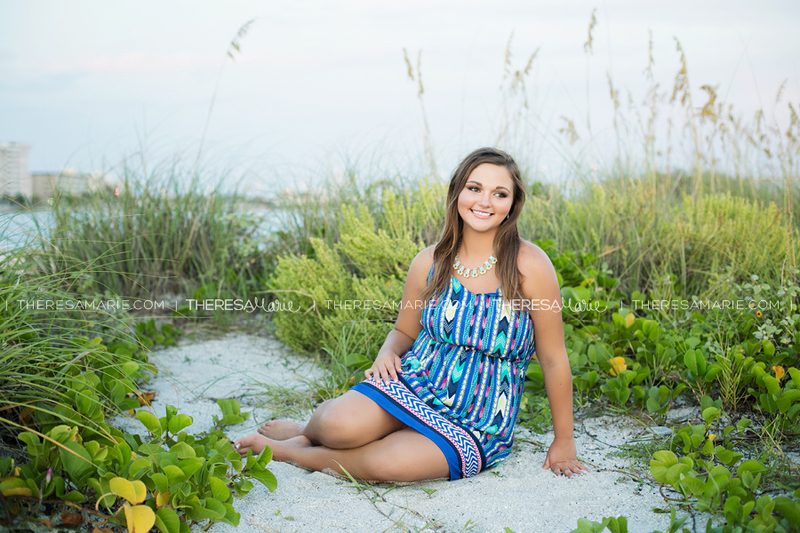 “We were all very hesitant at first that we were going to take my senior pictures (a huge milestone in my life) all the way in Florida! 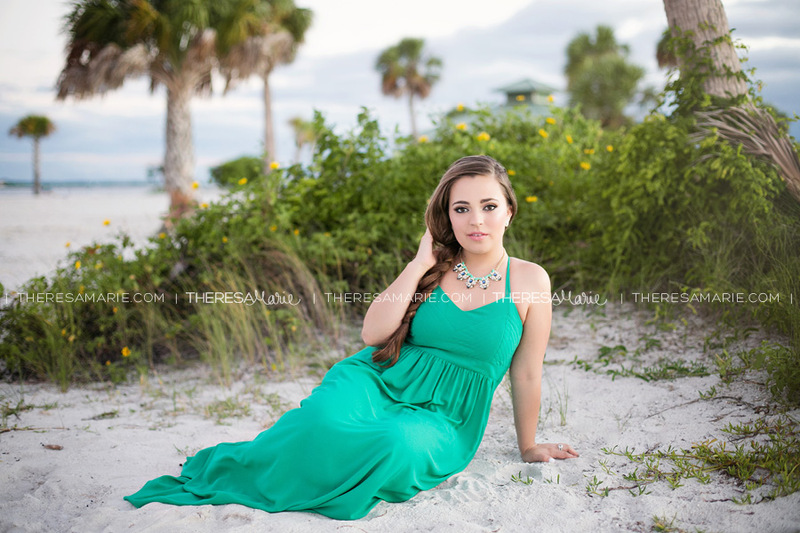 We had never heard of anyone from around where I live going to the Clearwater area for pictures so we had no idea where to even start! I got online to look around and as soon as I saw Theresa’s pictures and how amazing they were I knew she was going to be the one! There are no words to explain how truly amazing my experience was. 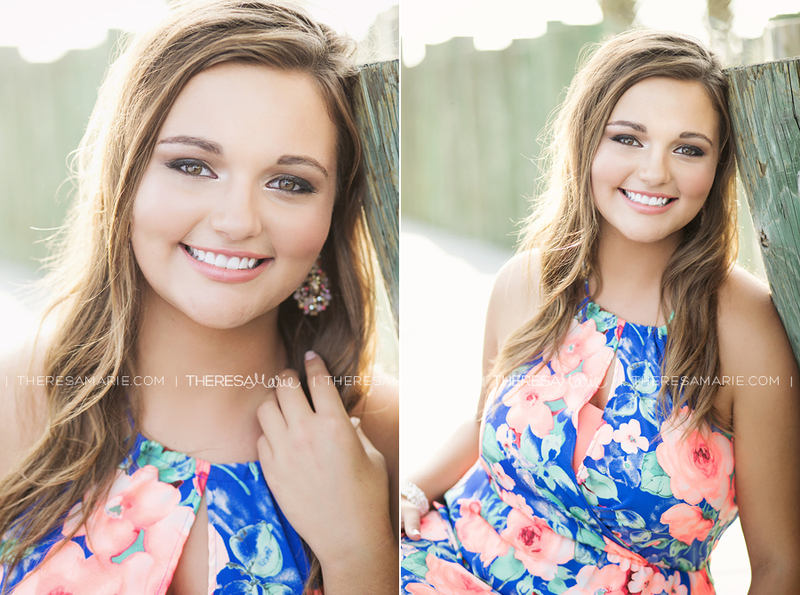 Theresa was so uplifting and made me feel beautiful in front of the camera! My absolute favorite part was how I didn’t even feel like I was taking pictures at times, we were having so much fun! It was such an amazing experience; I would not have changed a single thing! She will capture every quirk possible of yours to remember your entire life. 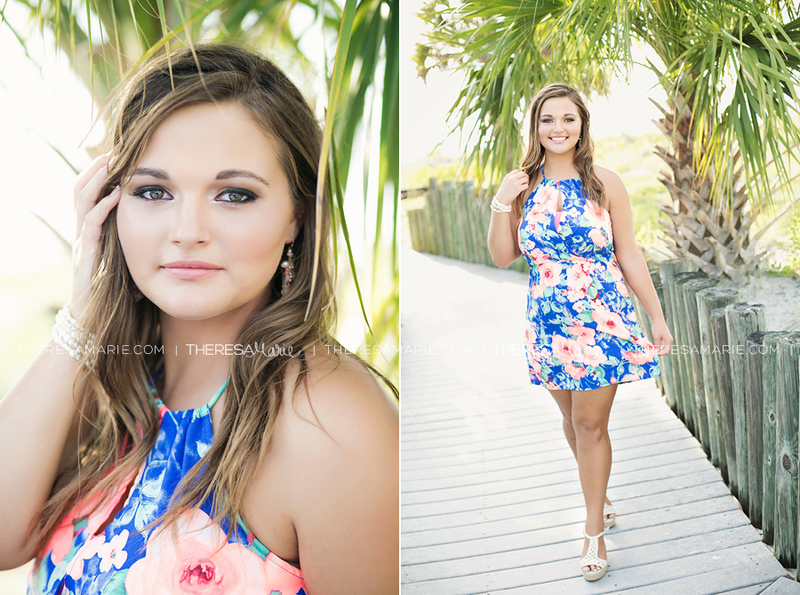 Theresa Marie does so much more than just take pictures, she captures your inner and outer beauty! She taught to be my own kind of beautiful! My role models would be my parents! They do everything they possibly can to make sure my sister and I get to do and have what we want. I hope someday I can be as amazing of a parent to my kids as my parents are to me! I love the Hunger Games series and the Divergent series! I also love any books by Nicholas Sparks! To travel to as many places over sea as possible, be the coolest parents to my kids someday, and to live a happy life with my soulmate! Save enough to pay off my entire college expenses, buy myself a new car, give my parents a little, and to just save up for a rainy day! Making it to state in both volleyball and basketball my freshmen year! 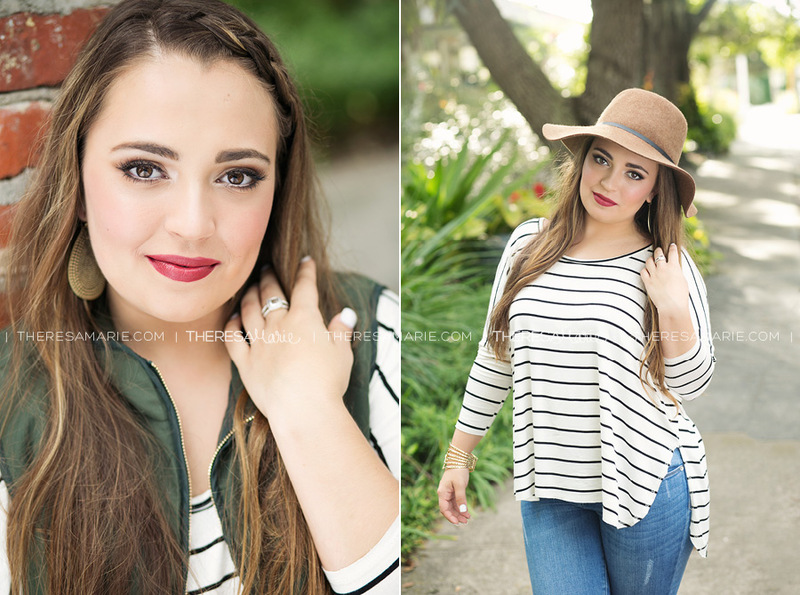 “For years, I have envisioned my senior photos and upon seeing Theresa Marie’s work instantly knew that I wanted her as my senior photographer! 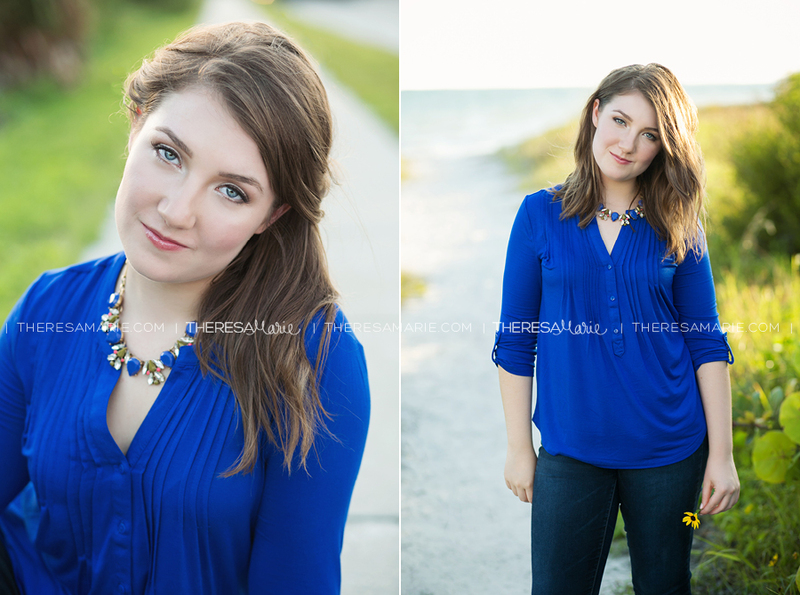 Before discovering Theresa Marie, I worried that my senior photos would appear stuffy or look unnatural. However, as soon as I saw Theresa Marie’s work, my worries disappeared! 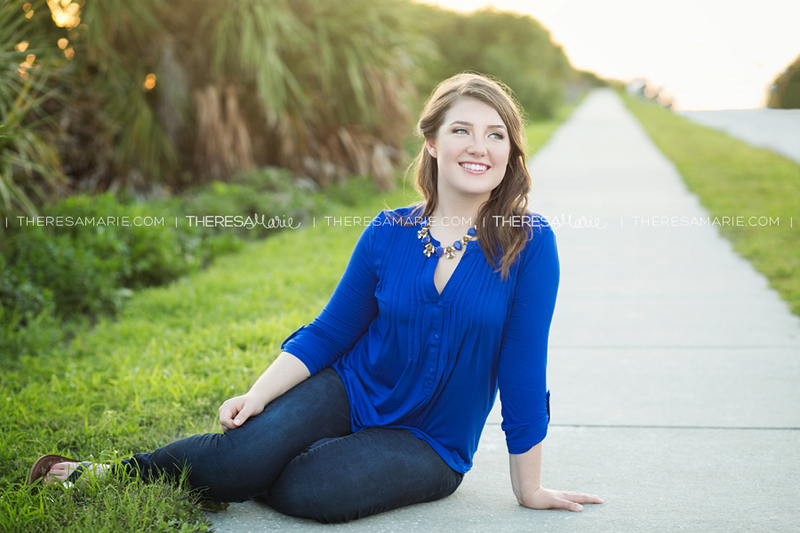 I chose Theresa Marie because her photos seemed to capture personality and happiness. 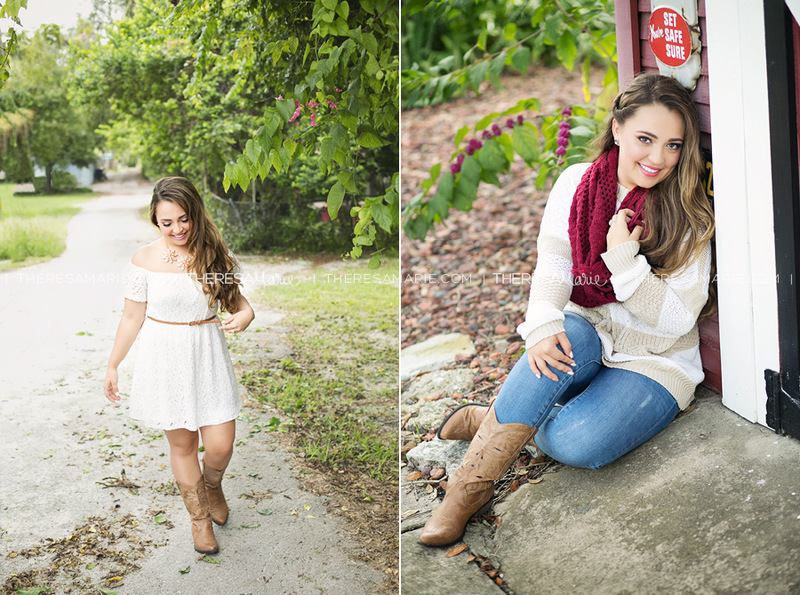 I also loved Theresa Marie’s use of beautiful outdoor settings and how she makes each picture unique! The experience was even better than I could have imagined and it exceeded all of my expectations! 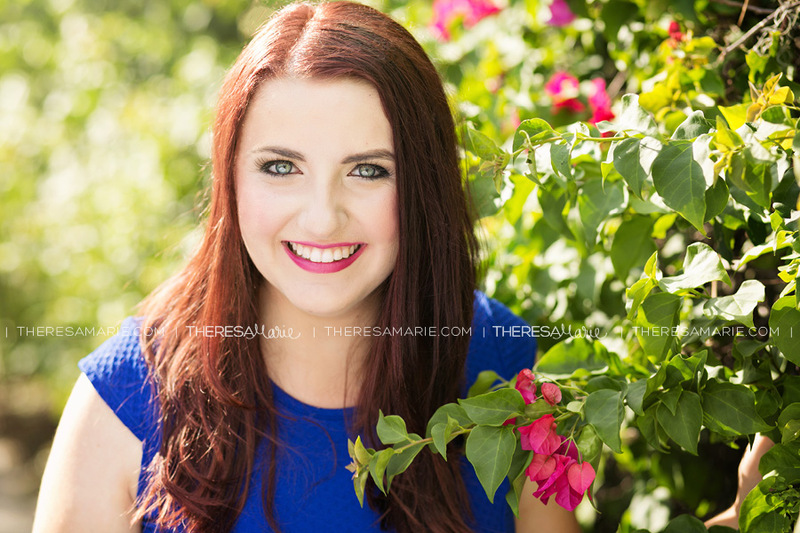 Theresa Marie’s enthusiasm was infectious and made me even more excited for my shoot. She is the sweetest person ever and made me feel super special! While I loved the reveal of the images, my favorite part of the experience was the shoot, especially on location at the beach. While I am usually hesitant to have my picture taken, Theresa Marie made me feel comfortable in front of the camera and the entire shoot was so much fun! The day was an absolute blast and was a great way to start my senior year! It’s a day I’ll never forget! When I first saw my images I was in awe! My images were everything I imagined and more! I couldn’t stop smiling! 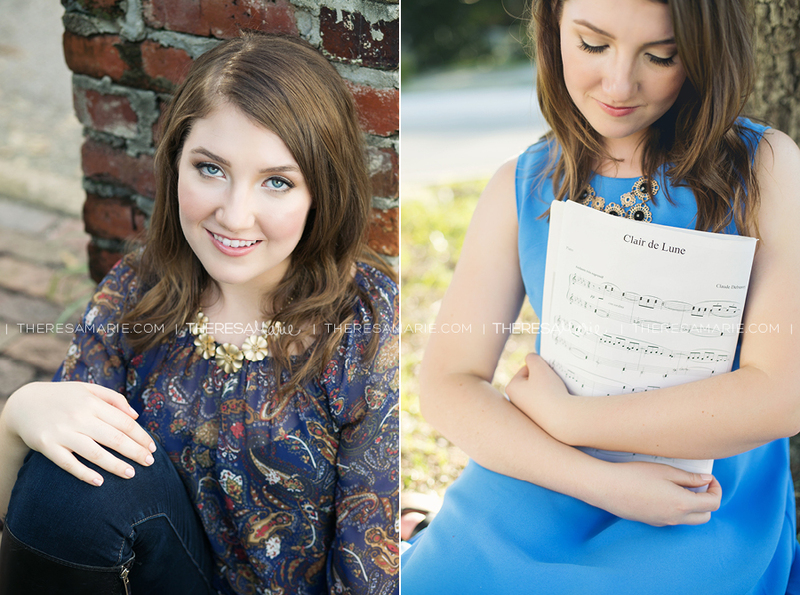 Theresa Marie is so talented and really captured my personality in each picture–I will cherish them forever! 1.) Go to the French Riviera 2.) Help make a lasting difference in someone’s life 3.) Be the musician in a wedding 4.) Publish a book or produce a Broadway show 5.) Appear on a TV show in China (there’s a story behind this I promise!). My parents becuase they are extremely selfless and caring. The author John Green because of his intelligence and sense of humor. Pay for college, buy a grand piano, donate to a non-profit, and save the rest for my parents and my retirement. Traveling to DC to compete with my History Bowl team. US Ambassador to China or working for the United Nations. 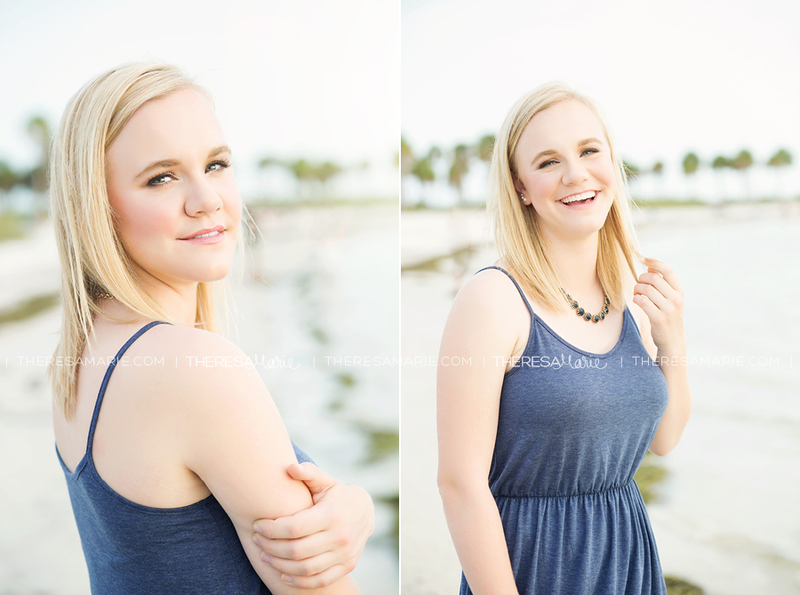 “I’d always wanted my pictures done by the water and my family was planning a trip to Clearwater, so I thought it would be the perfect opportunity to get my senior pictures done. I started looking up different photographers in the Tampa and Clearwater area and I came across Theresa Marie. I’m so glad i did because I instantly fell in love with all of her images. I could really tell that she loves what she does and that she genuinely cares for her seniors. My photo shoot could not have gone any better. 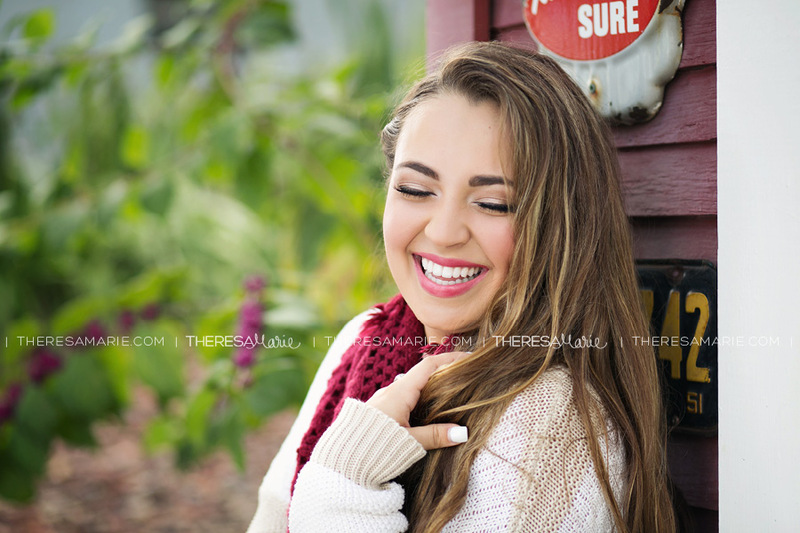 I was so excited and Theresa Marie made me feel super comfortable in front of the camera. I felt like a superstar and that’s how you should feel. Oh my gosh, when I saw my images I was speechless! I loved every single one she showed me, they were better than I ever imagined they would be. My mom for sure! She is the strongest, sweetest, most outgoing person you will ever meet and she always has a smile on her face. I hope that I will be able to give my family everything just like she does. Scuba diving, road trip with my friends, see a shooting star, travel around the world, and have a paint fight. I love so many movies but some of my favorites are Finding Nemo, 17 Again, and Easy A!